Small Granular Incense Kits from The Realm of White Magic - Handmade in Australia using only the finest gums, herbs, resins and oils....Secure On-line ordering. 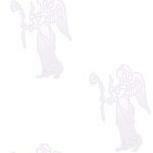 The Realm Of White Magic - Specialists in magical supplies since 1989. Small Granular Incense Kits from The Realm of White Magic - Handmade from the finest gums, resins, oils and herbs. Made in Australia. Secure On-line Ordering - Visit us now! One of the most ancient customs in religious and spiritual practices, is the burning of granular incense. It has always been believed that to scent the atmosphere with fine, rare and exotic fragrances will attract the Gods, Angels and good spirits. Whatever your spiritual path, there is an appropriate blend for every purpose. Small Granular Incense Kits contain a 10gm pack of incense and two charcoal disks. Ideal for trying various fragrances or when you require only a small amount of incense for your purpose. Sandalwood possesses very high spiritual vibrations. Use for protection, healing, purification and meditation. Burn to attract money, customers and material gain toward you. Burn this incense to bring the vibrations of love into your life. Light a candle and this incense to gently guide you through your meditation. Burn this incense for a successful outcome to any project. 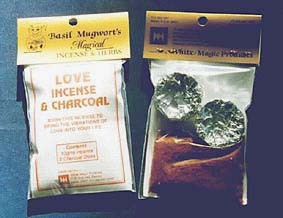 Burn this incense to attract prosperity and riches into your life. Granular incense is burned by sprinkling small amounts on Incense Charcoal. 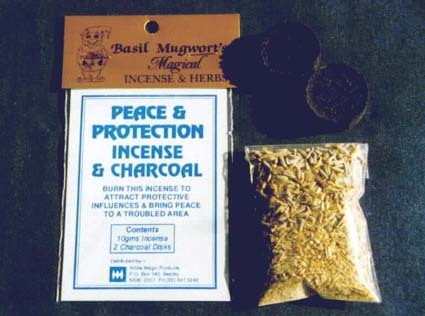 Click here to discover How To Burn Granular Incense. Click here to discover Gums And Resins. We want your opinion, Please Email with your feedback. Specialists in rare botanicals, incense and magical supplies since 1989. © 1989 - 2014 The Realm Of White Magic - All Rights Reserved | Images © White Light Creations | Please seek permission first! Subscribe to White Magic - Its Free!